If you believe that we are experiencing record high temperatures this year, could you please explain two things. Why is Texas experiencing below average temperatures? Also, Texas experienced the fourth most rainfall for the month of July ever this year. Furthermore, how can you say CO2 drives temperature when ice core samples from Greenland show the opposite and an 800 year lag for the increase in CO2 for the last 12,000 years. In addition, can you really deny the fact that as sun spot activity increases, so do temperatures? I'll leave it there for now. I simply want to keep this discussion honest so people like Sun Tzu can form an un-biased opinion. Response: "Why is Texas experiencing below average temperatures?" Some regions will experience cool conditions but a number of countries are experiencing record high temperatures this year. 15,000 Russians died in their record heat wave last month. A few months before that, thousands of Pakistanis and Indians died in record heat waves. When you average out the whole planet, we're currently experiencing record high global temperatures. "how can you say CO2 drives temperature"
We know this because the increased greenhouse effect due to rising CO2 has been directly observed by satellites and confirmed by surface measurements. In other words, several independent measurements directly observe that CO2 is trapping heat. "ice core samples from Greenland show the opposite and an 800 year lag for the increase in CO2 for the last 12,000 years"
This is discussed in detail on the "CO2 lags temperature" page. In short, warming causes CO2 rise and rising CO2 causes warming. This is a positive feedback and part of the reason that the planet is able to get out of an ice age. I feel it is important to mention many areas are cooler than normal. For example, parts of China and the Pacific Northwest of the US. In the 1920's, Russia had over 600,000 deaths due to malaria. Thought I would throw that out there before you mentioned anything about AGW spreading disease. Pre-industrial era, an increase in temperature first must happen for increased oceanic evaporation which increases greenhouse gases. 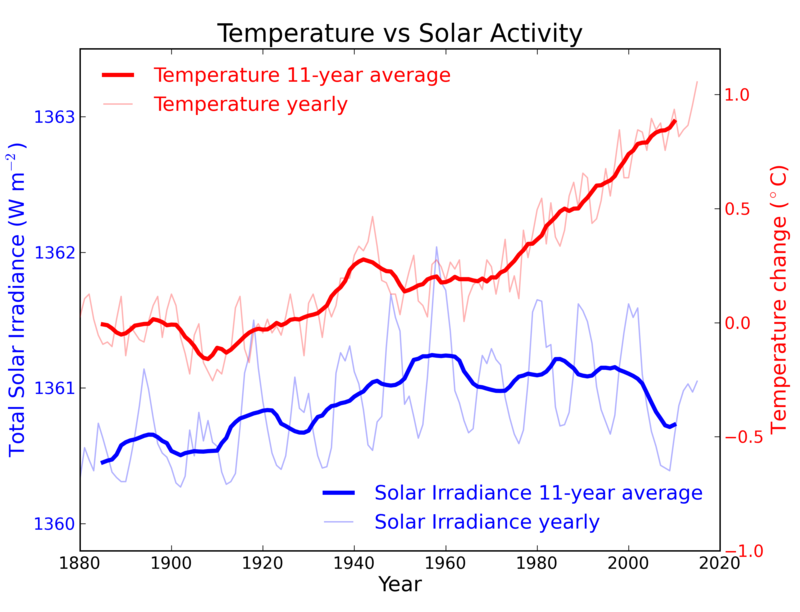 I also would be interested in a response to my statement on the correlation of sun spot activity and temperature. Response: For the record, I wasn't talking about AGW spreading disease in Russia - the 15,000 deaths were directly heat related due to record hot temperatures. To answer your question "can you really deny the fact that as sun spot activity increases, so do temperatures? ", no, you cannot deny that. As the sun gets brighter (eg - more sunspots), the Earth receives more energy and warms. Conversely, as the sunspot activity falls, this equates to less energy reaching the Earth. Over the last 40 years while global temperatures have been rising, the sun has shown a slight cooling trend. This means the sun cannot be causing recent global warming and in fact, is slightly masking the global warming trend. GnDoty wrote : "I feel it is important to mention many areas are cooler than normal. For example, parts of China and the Pacific Northwest of the US." It's only important if it's true, but your statement would only be true if you replaced the word "many" with "some". If you believe otherwise, please post some evidence. GnDoty wrote : "In the 1920's, Russia had over 600,000 deaths due to malaria. Thought I would throw that out there before you mentioned anything about AGW spreading disease." That is simply a diversion and this is not the place to go into types of malaria and treatments available back in the 1920s. With regard to sunspots, look here. Also, a quick search found a page with this graph. Does the declining trend since the 60s correlate with the increasing temperatures we have been experiencing ? You might find this USA site handy. This is for the global stats, but you can choose a selection of national and global reports at the top. I had a quick look at one of the USA and there didn't seem to be much difference, but you might be able to track down what you're after with more focused steps through the topics. I find it interesting the only rebuttle to sun spots driving temperature is a 40 trend, which is a blink of the eye in geologic time. If you feel compelled to reveal further evidence, please do so as physical, and not computer modeling. GnDoty at 23:42 PM on 16 September, 2010 .... physical and not computer modelling. I'm not sure what you're getting at. I had a quick look through Jmurphy's references and there were a couple of projected trends but apart from that, all the other information, like the one I referred you to, were simply records of temperatures or observations of sunspots and related phenomena. Do you have a specific question about any of these? GnDoty writes: I find it interesting the only rebuttle to sun spots driving temperature is a 40 trend, which is a blink of the eye in geologic time. So? Why does this strike you as interesting? Let's say you want to explain the modern temperature rise. You have two possible culprits: solar activity or CO2. Prior to this time period (say, 1800s to 1960-ish) solar activity and CO2 were both increasing, so it's not possible to rule either of them out. From the 1970s on, however, solar activity starts decreasing, while CO2 keeps increasing. Thus, solar activity can't explain the post-1970 rise in temperature but CO2 can. It's fairly simple logic. Looking at solar activity over longer time periods is no doubt scientifically interesting, but not really necessary to rule out solar as the cause of recent warming. GnDoty, as adelady writes, the sunspot numbers representing that "40 trend" (going back to the 60s) are ACTUAL not modelled - apart from the projected figures beyond 2010, of course. Anyway, how about going back to 1850. What's the correlation there ? Shall we go further ? Sorry for my typo, which should have read 40 year trend. You can cherry pick time periods all you want. The fact is climate changes without the influence of man. That's why we find whale fossils in the Sahara Desert and shark teeth in north Texas. The position you are taking is essentially that man is more powerful than mother nature and can control climate. Do you honestly believe humans can prevent climatic events like the many that have occurred in the past. If you answer no for any of those events, then why are we focusing on it. I'll answer for you. Money and power. GnDoty writes: "I find it interesting the only rebuttle to sun spots driving temperature is a 40 trend, which is a blink of the eye in geologic time." Yes... because it is well known that sunlight travels at speeds best measured in 'geologic time'. GnDoty--that's ridiculous. Has anyone said anything about "controlling" climate? Are you saying that humans can't change climate? If we dropped ten nuclear bombs in ten large volcanoes, the thirty-year trends would certainly be affected, and that's a tiny amount of power we can wield over our environment. We have the power to kill most of the life on this planet in a matter of days. I wonder if that would affect climate? The oceans are becoming more acid due to relatively rapid saturation with CO2, and life, marine biologists reveal, is having a hard time adapting in such a short time. Where might this added CO2 have come from, I wonder? The time is long, long past where we wonder whether or not we have an effect on the nature of Earth. We eradicate species on a weekly basis. At what point in the process of replacing nature with concrete and asphalt do you suddenly realize that humans (a part of nature, by the way) are quite capable of changing climate? Controlling? Well, that's another matter--but it will be tried over the next century, even if the attempt is blunt, unwieldy, and ultimately does more harm than good. Climate certainly does change without the influence of humans, but you're willfully ignoring the nature of this recent, very rapid climate change that is occurring against the grain of several your major natural cycles. Why aren't "we" as a species taking responsibility for this change? I'll tell you: money and power. My replies have been between classes so I apologize for the short responses. "Has anyone said anything about "controlling" climate?" Well yes, you did when you said "Controlling? Well, that's another matter--but it will be tried over the next century, even if the attempt is blunt, unwieldy, and ultimately does more harm than good." So you're telling me we are more worried about the acidity of the ocean from CO2 saturation (which is balanced by higher temperatures causing more evaporation) than places like the mississipi delta dead zones due to fertilizers from agriculture up-river. I'm glad we agree this is about money and power. Spot-on, sir. Diagnosis 100% correct. Blinders off. The down side to being able to see is this realization: most people intuitively understand that we are "heading for a cliff", which is why they close their eyes, stick their fingers in the ears, bury their heads in the sand & repeatedly mumble "it can't happen, it can't happen..."
It can, it will, it's almost here. Very sobering, this seeing thing. GnDoty, it appears that you believe in a conspiracy by politicians and scientists to take all our money, remove all our freedoms and lord it over us ? Even if you don't actually believe all that, it would appear that your political beliefs are getting in the way of the facts. If that is not the case, you will obviously want to learn more and this website is good for that. If you are truly serious about the truth about all this, you will look at the above and then come back and tell us what you disagree with and why. Response: Indeed, GnDoty, please not only read the posts at those links, but put your comments on whichever of those posts is relevant. This post is narrowly focused. Off topic comments usually are deleted. My impression, reading your posts, is that you have been disinformed (as opposed to misinformed) as to the basics of climate change and CO2's role in regulating temperatures. No harm in ignorance, as long as one is truly seeking a better understanding of things. Here's a short version of CO2's role as a greenhouse gas. I would add to that the fact that the amount of fossil fuel CO2 concentrations man adds yearly to the atmosphere is 100 times that as produced annually by all of the Earth's volcanoes worldwide. CO2 is intricately linked to global temperatures and is the biggest temperature control knob of the GHG's. We see in the paleo record that natural changes in forces have operated historically at the millennial and geologic timescales. Change typically is slow. The record is punctuated, however, by short bursts of rapid change in both CO2 concentrations and temperatures. The paleo record is a good place to look for context. However, there is no comparable point anywhere in the record where CO2 levels have spiked so dramatically on such a short timescale. In 150 years, man has raised CO2 concentrations 40% of pre-industrial (read: the maximal levels of CO2 concentrations in inter-glacial periods). The rate of change is now the issue. Because of that, various feedbacks that could be expected to arise when change is slow seem to be not occurring as previous. For example, the ability of the oceans to sequester CO2 seems to be dropping (the base of the oceanic food chain, phytoplankton levels have dropped 40% in the last 40 years), the volume of the Arctic Ice Sheet is at an all-time low (surprise: the Arctic Ice Sheet acts as a carbon sink as well) and we may be seeing the pole area ice-free in summers as early as 2012 (inhibiting its function as a carbon sink). I will mention but not even discuss methane clathrate/hydrate releases already underway. We now know that we need never worry about Ice Ages again (one large factory can emit enough CO2 yearly to forestall decent into ice ages). The biggest remaining worry: will we still be able to produce enough food in a changing climate (droughts and floods play havoc with soil productivity) to support a population expected to reach 9 billion? Between unendurable heat and floods (Pakistan is the current poster child for both) becoming commonplace & suppressed food production will eventually cause significant human losses and migrations, creating enormous social and political unrest. Wars will occur, possible with nuclear exchanges. This is what the science is telling us. This is what the future holds in store. You are intelligent. I have read your comments. All that is lacking is a better understanding, one not blocked by an active disinformation campaign. Fill your mind with the coins of your pocket and your mind will fill your pockets with gold. Interesting site with erudite comments and very well moderated, thank you John Cook. I recall in 1971 the Big Worry was global cooling and then the Modern Solar Maximum started up coincident with "global warming." I'd be interested in seeing the actual facts on global temperature measurements, i.e. what sites were used, what data controls are on those sites, who owns them, who pays for them, and when were the measurements taken. I know for a fact that many of the meteorological sites in the Russian high Arctic that had been reporting since the 1940s were shut down when the Soviet Union collapsed, and this resulted in a spike in reports from more tropical sites. Some Smart People think this led to a false sense of "global warming." But if you look at prehistoric periods of mass extinctions, they seem to all be associated with global cooling, not warming. Geologic periods of global warming seem to have all been associated with a great diversity of life. So what then should we fear most? All I know is my tomatoes did very poorly this year because “they” say it has been the 13th coldest summer in the US Pacific Northwest since 1941... and when I can’t grow food to eat because it is too cold, I starve. So show me the unbiased, actual, unspun, factual temperature data please. Beagle, to save everyone here (and yourself) from going over arguments that have been brought up many times in the past, I suggest you have a look at Skeptic Arguments and What the Science Says because most of your assertions are in the Top 10 there. Read what they say and then come back and state what you disagree with. Also, you state that you definitively know one thing : "I know for a fact that many of the meteorological sites in the Russian high Arctic that had been reporting since the 1940s were shut down when the Soviet Union collapsed, and this resulted in a spike in reports from more tropical sites." Facts should be quite easily proven and backed-up, so could you provide a link to the facts concerning shut-downs and the "spike" ? Response: Beagle, please do as JMurphy suggested. Also, please respond to his request for more info not on this thread, but on the thread Dropped stations introduce warming bias. The policy on this site is for off-topic comments to be deleted. "Off topic" on this site means off topic of the particular post on which the comments are appearing, such as this "It's the Sun" post. Often conversations start as asides on an irrelevant thread, which is okay as long as immediately those conversations continue on a relevant thread. In such cases, it's fine to post a short comment on the original thread, pointing readers to the continuation on the relevant thread. I say the Sun is the dominant factor in climate change. If you read the new work by Frederick Bailey, on the soon to launched web site www.solarchords.com and his books, you will see the background to two discoveries, one is, what drives sunspot production, the pattern has been discovered and this led to a much greater discovery i.e. It has been cleary shown that the generally accepted value of 1AU for the Earth - Sun distance around the ecliptic plane has been found to be wrong. This work clearly shows that sunspots per se do not influence climate change but because the way they are produced, they are indicators that the AU value is changing and it is this that affects the climate. Because the two events are closely linked in time, people thought that sun spots cause climate change, they do not. "There is no single continuous satellite measurement of Total Solar Irradiance"
In researching the this and other sites I soon realised why the TSI variation that should be seen has not been identified, because only the variation in the output of the Sun is being measured, not the total output or TSI. The variation is then appliked to the standard figure of 1368w per Sq M and allowing for the expected orbital position. Bailey's work clearly shows the reason for the historical hot and cold periods etc. Climate Scientists who limit their consideration of the influence of the sun on earth’s climate to TSI overlook a far more significant factor which is the influence of solar magnetic fields, as indicated by the proxy of sunspot number time-integral. Fewer sunspots means lower magnetic field, less shielding from galactic cosmic rays, more low-level clouds, lower average cloud altitude, warmer average cloud temperature, more radiation from the planet and thus a cooling planet. An equation based on the first law of thermodynamics that includes the sunspot time-integral, effective sea surface temperature (ESST) and atmospheric carbon dioxide level accurately calculates all average global temperatures since 1895 with a coefficient of determination of 0.88. 619: "lower magnetic field, less shielding from galactic cosmic rays, more low-level clouds, lower average cloud altitude, warmer average cloud temperature,"
The supposed link between galactic cosmic rays is discussed here. Response: cruzn246, that is one of those cues to continue discussion of that topic on that other thread. Further comments on this thread will be deleted without warning. Apparently there is more to the cosmic ray story than considered so far. The 15% estimate of temperature increase reported there is less than half that determined using the equation. A common mistake is looking at only cloud cover instead of average cloud altitude. Consideration of the sunspot number time-integral accounts for about 39% of the average global temperature run-up from 1909 to 2005. This is equivalent to an increase of average cloud altitude of only about 115 meters. ESST (PDO appears to be the dominant contributor) also accounted for about 39% of the temperature run-up. CO2 accounted for about 22%. Ken Lambert - In regards to your ongoing insistence on unmeasured solar influence, I will point out that some of your issues with 1750 are based upon an inconsistent and incorrect view of "baseline". Forcings are set to zero starting at 1750 in many discussions as a point of reference for anomalies, not because of an equilibrium state. According to the historic and paleo reconstructions, without industrialization we should have seen 1750 onward continuing the Little Ice Age slope, and cooling (not equilibrium). By comparing TSI, CO2, aerosols, and other elements to the numbers at 1750 we can see how they've changed over time, and hence determine which changes are more relevant to the changing climate. But it's absolutely NOT a zero sum game starting from a blank slate equilibrium - which you for some reason keep insisting upon. And finally, given the historic record of changes in solar forcing, your insistence on "it's the sun" is not supported - there have not been changes in solar output consistent with the temperature record over the last 30-40 years. The sun is clearly not the base cause of global warming. This starts from a baseline of 1880 (where the "zero" is set), showing deltas (changes) from those values. Note that solar irradiance deltas are trivial compared to greenhouse gases and aerosols. Once again, TSI is not the driver of recent warming. TSI changes simply do not match the temperature record. I also went through this solar versus CO2 versus other stuff with Ken a while ago using regression modeling. I clearly demonstrated that during the early 20th century, solar forcing was dominant, while during the end of the 20th century CO2 forcing was dominant. The other variables plugged into the equation were not of terrible practical significance. Anyway, in his wisdom, Ken decided to reject the results of this analysis for reasons that he could not explain coherently. kdkd - I've found your posts on statistical analysis fascinating, and I did see your earlier exchange regarding solar forcings. Do you have any suggestions for someone (like me) who isn't as familiar with the statistical analysis? Somewhere to get a decent overview on how to look at things like internal variability, sample time required to attain 95% confidence based on variation, or perhaps some of the other topics discussed here with respect to justifying conclusions? I know it's a big topic (eek! ), but any pointers would be helpful. kdkd - I'll take a look at your recommended book; if it's as good as their one on genetics, which I've given or pointed out to a number of people, it should be excellent. I can certainly supply some naive if you'd like! There is no way that the above chart could allow Solar forcing to be dominant in the first half of the 20th century as concluded mostly correctly by kdkd. By setting the Solar forcing to zero in AD1880, when all other forcings except the volcanic aerosol (mainly from Krakatoa) are in fact zero or negligible in order to measure 'differences' ignores the fact that the actual value of the Solar forcing is in the range of 0.3 - 0.5W/sq.m and ongoing since about AD1700. There is a major dip in Solar and huge Volcanic cooling around AD1815 coinciding with Tambora, but the Solar forcing curve is positive and increasing in the 0.3 - 0.5W/sq.m range up to the present. If you agree that the areas under the curves represents the energy attributable to each forcing, then there is positive area under the Solar forcing curve since AD1700. Ken writes: the actual value of the Solar forcing is in the range of 0.3 - 0.5W/sq.m and ongoing since about AD1700. Ken, on the IPCC graph you link to, the black line is well below 0.3 until the 1930s. It never rises as high as 0.5. It also turns downward after 1975. Looking at the period since 1750 to the late 20th century, solar forcing goes from about 0.15 to 0.45. Over the same time period, GHGs go from 0 to over 2.5. So yes, solar irradiance does account for a large part of the warming from 1750 to 1900, and a smaller part of the warming from 1900 to 1940. It accounts for very little of the warming post 1940. Both KR's graph and the IPCC one you link to show this. It also clearly shows my point. Given that the chart I linked from GISS shows deltas from 1880 (not 1750), and in agreement with your chart indicates a TSI delta over that time of ~+0.4W/m^2, while the "All other forcings" in both charts from GHG's sum to ~2W/m^w at the current time, I fail to see any disagreement in our data. The slight rise in TSI seems to be important ('tho not overwhelmingly so) in the early part of this century, warming was damped by high aerosols mid-century, and in the 70's (accompanied by the Clean Air acts and aerosol reduction) GHG forcing became the very dominant factor. Now, as regards to ...setting the Solar forcing to zero in AD1880"", Ken, you still appear to be suffering from some misapprehensions regarding what delta (anomaly) baselines are used for. The chart I linked from the CO2 is not the only driver of climate looks at deltas since 1880, while the one you linked from NOAA/IPCC (here's the article link backing that chart) looks at deltas since ~900AD. Was the climate at equilibrium in 900AD? No. Was it in equilibrium in 1880? In 1750? No and no. But we can certainly look at changes in forcings versus changes in climate, and determine from magnitude and correlation which forcing changes are the dominant drivers of the current temperatures. And, given that information, it's clear that it's not the sun driving late 20th century temperature rises. Nor, for that matter, is it a badly mis-measured TSI at the start of any of these time periods, integrated over the period, as that would show up as a monotonic temperature change over the period of mis-measure, a difference in slope between TSI and temperature. That simply isn't present; there is no unmeasured offset. 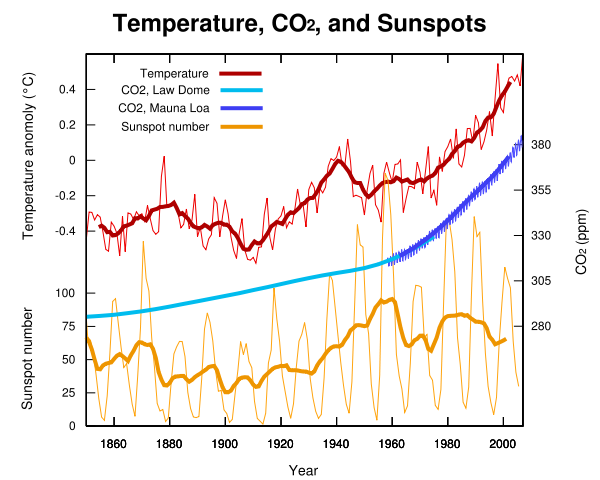 What's illustrated here are the various forcings on climate, temperature reconstructions (gray bands covering uncertainty ranges on lower graph), and multiple climate model runs with and without anthropogenic forcings. Looking at the lower right of the bottom graph you can see matched color traces with/without GHG additions. It's clear that without the GHG forcings (but with the solar forcing) none of the models can match the current temperature trend. They all predict temperatures going back to levels of the early 1800's. Add the GHG forcings back in, and voila - all the models track measured temperatures fairly closely. One side note - the previous posting included a graph that only runs to 2000, not up through 2010. Ken #629: "By setting the Solar forcing to zero in AD1880, when all other forcings except the volcanic aerosol (mainly from Krakatoa) are in fact zero or negligible in order to measure 'differences' ignores the fact that the actual value of the Solar forcing is in the range of 0.3 - 0.5W/sq.m and ongoing since about AD1700." As has been explained to you before, a 'forcing' is a CHANGE from the baseline value. If 1880 is the baseline then BY DEFINITION the forcing in 1880 is zero. Has to be. That's what the words MEAN. Well my model was derived empirically from IPCC data. It was pretty naïve statistically speaking, and the model wasn't without its violations of assumptions. On the other hand as the magnitude of CO2 versus solar forcing was roughly consistent with my regression model, I don't see how Ken reaches his conclusion that "is no way that the above chart could allow Solar forcing to be dominant in the first half of the 20th century" (it would be nice if Ken referred to which chart). I think he's got to get over the confirmation bias. How about we agree on 0.2-0.5W/sq.m for the range of Solar forcing since AD1725. Gridding a very small scale graph I get AD1725 for when the Solar forcing crosses above the 'zero' axis which is pretty close to the end of the Maunder minimum around AD1715. "Was the climate at equilibrium in 900AD? No. Was it in equilibrium in 1880? In 1750? No and no. But we can certainly look at changes in forcings versus changes in climate, and determine from magnitude and correlation which forcing changes are the dominant drivers of the current temperatures." Well you tell me KR. How do you know it was NO and NO? Prima facie, the zero axis on the graph implies that positive Solar forcings will add energy and warm the Earth and negative forcings will lose energy and cool the Earth. Is the 'zero' axis not the zero Solar forcing and equilibrium TSI where the Earth neither warms nor cools due to Solar?? If not what else could it be?? If you look at the areas under both Solar and 'All other Forcings' curves in Fig 613 back to the start of the current warming ARO AD1725 they both represent the energy added to the Earth system and they both add together. I don't have an electronic way of doing this but could scan this with an ACAD planimeter and get an estimate on a reasonably scaled graph. kdkd could probably do this with the raw data. Using some crude geometry I have calculated the area under the Solar curve at 9300E20 Joules and the 'All Other Forcings' curve at 10600E20 Joules. I assume that 'all other' means every forcing on your chart at #623 netted into one curve. This gives a roughly 45/55% ratio Solar/All Other for not just the first half of the 20th century - but the whole period 1725 up to 2000. My point which brought on this debate is that if the 'zero' axis on any of the forcings (but Solar is most important due to its constant presence) was shifted down or up by a small amount - a large extra slice of area is added or subtracted from the area under the curve. eg 0.05W/sq.m shift over 250 years is over 2000E20 Joules in added or lost energy. I assume you are also not including the climate response forcings (IR cooling and WV feedbacks) in this analysis which net currently is -0.7 W/sq.m and would give a significant energy loss area under its curve to add to the Solar and All Other above. We are assuming here that Volcanic evens itself out over time which curve seems to be roughly equal in area above and below its 'zero' axis. When you talk of modelling temperatures and forcings - I assume you mean land and ocean temperatures - the response of which would have a thermal lag, as 90%+ of the calculated energy imbalance should reside in the oceans which have huge thermal mass. What would be the models' general assumptions regarding thermal lags in that composite temperature? Ken Lambert - You ask "How do you know it was NO and NO? "; how do I know that the climate wasn't in equilibrium in 900, 1750, 1880? Very simple, Ken. The slope of temperature change entering into those years, as shown by instrumental and proxy records, was not at or even close to zero. 1750 has perhaps the best (not perfect) chance of being at equilibrium of those three dates - 900 temps have a steady downward trend, part of the Little Ice Age, I suspect, while 1880 is in early industrialization with numerous forcing changes from early CO2. But as the various forcings move around, the climate can only follow, only hitting equilibrium if (a) forcings don't change for a period long enough for the oceans to catch up, or (b) forcings reverse and pass climate change going the other way. I believe (IMO) that you are stuck on the "baseline" definition here, Ken. A proper analysis starting from a baseline includes not only changes after the baseline (forcing deltas, in this case), but the original trajectory of the system prior to the baseline, which includes all forcings at that date. Given those you can measure magnitude and correlation of trajectory changes relative to forcing changes. Failing to incorporate the baseline trajectory, the history, would be a massive error - but as far as I can see nobody has made that particular mistake. Only you, if you insist that existent forcings at the baseline are not included in the original temperature trajectories. Your "large extra slice of area" is part and parcel of the non-equilibrium trajectory at the baseline date; part of the history. I really don't know what else I can say, Ken. It's really that simple. Ken Lambert writes: How about we agree on 0.2-0.5W/sq.m for the range of Solar forcing since AD1725. How about we don't try to maximize confusion by blurring the distinction between time periods? You claimed that a graph showed that "the actual value of the Solar forcing is in the range of 0.3 - 0.5W/sq.m and ongoing since about AD1700"
That was a highly misleading statement, since the actual graph showed it not even rising up to 0.3 -- the bottom end of your claimed range for the past three centuries -- until the 1930s. Ken continues: Is the 'zero' axis not the zero Solar forcing and equilibrium TSI where the Earth neither warms nor cools due to Solar?? If not what else could it be?? Ken, there is no unique "equilibrium TSI where the Earth neither warms nor cools due to Solar". No such number exists! There are infinitely many possible values of TSI which would produce neither warming nor cooling of the Earth. I keep making this point and you keep ignoring it. (3) The temperature is stabilized at a new, higher level, and the planet is neither being warmed nor cooled. You keep assuming that any departure from some imaginary equilibrium TSI would lead to perpetually increasing or decreasing temperature. That is just plain wrong -- fortunately, because if you were right there would probably be no life on this planet! Ken continues: Using some crude geometry I have calculated [...] This gives a roughly 45/55% ratio Solar/All Other for not just the first half of the 20th century - but the whole period 1725 up to 2000. You are once again lumping together different periods of time. I assume you're just inadvertently deceiving yourself rather than deliberately trying to deceive others. Before the early 20th century, solar forcing is much larger than GHG forcing. By the mid 20th century, GHGs are catching up and passing solar. In the late 20th century, GHG forcing is very large and solar is not merely smaller in relative terms, it's actually decreasing post 1975. Gah - writing too fast. In my previous post I should have said "1750 was part of the end of the LIA", not "900". "You claimed that a graph showed that "the actual value of the Solar forcing is in the range of 0.3 - 0.5W/sq.m and ongoing since about AD1700"
That was a highly misleading statement, since the actual graph showed it not even rising up to 0.3 -- the bottom end of your claimed range for the past three centuries -- until the 1930s." You are exaggerating and splitting hairs Ned. Some of the proxies are higher than the black line average and some naturally below. The highest is about 0.4W/sq.m circe AD1750. I can dig up the actual numbers from the site and check it - but for now 0.2 - 0.5 is good enough. My point about the area under the curve being the total energy is the critical one. "Ken, there is no unique "equilibrium TSI where the Earth neither warms nor cools due to Solar". No such number exists! There are infinitely many possible values of TSI which would produce neither warming nor cooling of the Earth. I keep making this point and you keep ignoring it." Again - such a number MUST exist for the pre-industrial (unforced by AG forcings) Earth. Conservation of mass would indicate that the Earth has a constant amount of dirt, water (in ice of liquid form) air etc etc. There would be an overall function which takes into account the specific heats, latest heats etc of the whole Earth system subject to warming by external forcings. "I assume you are also not including the climate response forcings (IR cooling and WV feedbacks) in this analysis which net currently is -0.7 W/sq.m and would give a significant energy loss area under its curve to add to the Solar and All Other above." The S-B IR + WV response curves should be included in these 'AG Radiative Forcing' charts with Solar so the viewers can get the real picture of the overall warming curve for the planet. Try harder next time Ned. Has anyone a comment on this report of variations in solar output during 2004-2007? "The amount of visible radiation entering the lower atmosphere was increasing, which implies warming at the surface," says atmospheric physicist Joanna Haigh of Imperial College London, who led the research, published in Nature on October 7. But the change from 2004 to 2007 in the sun's output of visible light, and the attendant warming at Earth's surface of 0.1 watt per square meter, is roughly equivalent to the overall forcing of the sun on the climate over the past 25 years—estimated by the U.N. IPCC to be an additional 0.12 watt per square meter. That suggests scientists may have overestimated the sun's role in climate change. Regardless, the solar change is dwarfed by the impact from the extra heat trapped by CO2 alone since 1750: an additional 1.66 watts per square meter, an effect that other greenhouse gases, such as methane, strengthen further. In other words, whereas the new satellite measurements call into question computer models of solar output, it does not change the fundamental physics of human-induced global warming. RC have a post up on it - which is basically "wait and see, we think it is instrument error". Ken Lambert - You haven't responded to my latest post. Do you understand that the 'baseline' is the starting point for forcing deltas, and that the incoming trajectory for temperature incorporates the forcings existing at the baseline timepoint? The offset you are so concerned about? *Including* the offset you are so concerned about? Ken writes: Try harder next time Ned. Not going to happen. After the fiasco of the Waste Heat thread, I'm no longer willing to expend indefinitely large efforts on repeatedly explaining the same points over and over again without any evidence of benefit. Yes, you do mention the OLR negative feedback that leads all forcings to decay towards 0 over time, as the planet's outgoing radiation increases or decreases. But you are still blindly ignoring this when you talk about your imaginary "equilibrium TSI". In fact, there is a continuous range of TSI values, any one of which can be balanced by a corresponding OLR value, leading to some particular stable temperature. There is no reason why one particular TSI value can or should be artificially promoted as the uniquely special equilibrium TSI that the Earth wants to be in balance with. If you still don't get this, someone else can take over, because I'm done. muoncounter #641: Yes, I saw that report too. The bit about the magnitude of any solar change being "dwarfed" by the increase in CO2 forcing makes it somewhat of a minor issue AND the researchers note that the results need further verification... but it is certainly an interesting new wrinkle. Unfortunately, if validated it would essentially mean that we can't be sure about precise solar forcings prior to this kind of detailed spectral analysis. Is a solar minimum ALWAYS accompanied by higher output of VISIBLE light or was that the case for this particular minimum but not all? Are solar maximums characterized by DECREASED visible light or exceptionally increased levels? However, again... the possible range of variation here is more than an order of magnitude less than GHG forcings. The report also shows that while the solar forcing for 2004-2007 may have been greater than would have been suggested by looking at total solar irradiance (rather than a specific wavelength analysis)... it was still less than the IPCC projected for this time period. Your "area under the curve" stuff is (from a statistical perspective) just a calculus-centric view of talking about regression models. We've done that to death elsewhere, and it doesn't confirm your over-complex, often illogical, statistically illiterate and difficult to ascertain argument. Come up with something new and I'll be happy to assess your arguments on its merits. This particular dead horse however is well and truely flogged. "the possible range of variation here is more than an order of magnitude less than GHG forcings. ... solar forcing for 2004-2007 ... was still less than the IPCC projected for this time period. " I thought those were the salient take-aways, especially in the context of 'its the sun' and 'its only the sun'. Funny how order of magnitude seems to get lost when discussing the role of various deltas. Clearly the waste heat thread went pear-shaped after I left. Ned: "Yes, you do mention the OLR negative feedback that leads all forcings to decay towards 0 over time, as the planet's outgoing radiation increases or decreases. But you are still blindly ignoring this when you talk about your imaginary "equilibrium TSI". In fact, there is a continuous range of TSI values, any one of which can be balanced by a corresponding OLR value, leading to some particular stable temperature. There is no reason why one particular TSI value can or should be artificially promoted as the uniquely special equilibrium TSI that the Earth wants to be in balance with. If you still don't get this, someone else can take over, because I'm done." Ned, you have just confirmed exactly my contention about a 'unique' TSI corresponding to a particular 'Equilibrium' temperature. "In fact, there is a continuous range of TSI values, any one of which can be balanced by a corresponding OLR value, leading to some particular stable temperature." Question: And can you guess what that particular temperature of interest is? Answer: The Earth's temperature in AD1750 which according to you and the AGW community is 0.8 degC COOLER than today's temperature. And what follows from that is that we have a TSI AD1750 corresponding to Temp AD1750. Pray tell me then Ned what is the value of TSI AD1750? And after you have done that you should than be able to advise what particular TSI value corresponds to an Earth temperature 0.8 degrees higher than that of AD1750. Ken Lambert - I would agree, there is one TSI for one equilibrium temperature of the Earth, with all other variables held constant. Of course, if you change (for example) CO2 levels, the equilibrium temperature for a particular TSI will change, as the radiative efficiency of the Earth will change. But all other variables are not held constant. The other radiative influence changes are much much larger over the last 150 years. This is a multi-variate issue, and you're only looking at TSI vs. Temperature!!! - And most importantly, you're not (in any of the recent comments here, here, or elsewhere) including the CO2 or aerosol radiative deltas in your 'equilibrium' considerations. This horse has been flogged to death, Ken - you are hunting for a solar cause, you are not considering the relative magnitudes and importance of the radiative factors, and have ceased to add content to the discussion some time ago.